Established in 1990, The Billfish Foundation’s Tag and Release Program is the largest private billfish tagging database in the world and the cornerstone of TBF’s conservation and advocacy efforts. With more than 220,000 tag and release reports, TBF receives over 15,000 tag and release records annually from across the globe and provides vital information for billfish conservation. The success of TBF’s Tag and Release program is contributed to the dedicated anglers and captains around the globe that voluntarily tag, release, and report their billfish catches. The deployment of traditional tags and the data gathered from recaptured billfish provides valuable scientific data to further understand growth rates, migratory patterns, habitat utilization, and post-release survival rates. Tag and release data also provides valuable information for stock assessments that are instrumental in a time when industrial longlines represent the largest source of marlin mortality. This valuable data, much of it impossible to measure without the use of traditional tagging, provides the groundwork for conservation minded policy, scientific advancement, and gives insight into the demographics and socio-economic benefits generated from billfishing. As tagging provides The Billfish Foundation with substance for its conservation efforts, TBF recognizes those anglers and captains that tag and release the most billfish each year at an awards ceremony at the Miami International Boat Show. The annual International Tag & Release Competition recognizes members who tag and release the most billfish by species in each of the world’s oceans. TBF award winners are the ‘who’s who of the billfishing world’ and are those that do not just catch and release a great number of fish, but embody and share a common conservation ethic. As captains and anglers on the water represent the first line in billfish conservation, recognition of their efforts provides a means to illustrate the direct link between catch and release fishing and marine conservation. To recognize the efforts of all of its members, TBF also provides release certificates for those that report billfish tags and releases. Bring the billfish alongside the boat. Idle the boat forward and maintain this position to allow the billfish to calm down and allow for easier tagging. Never attempt to tag a jumping or thrashing fish. This can be not only dangerous for the health of the billfish but for you too! NEVER remove the fish from the water. This can result in fatal damage to the fish for two reasons. Excess rubbing and drying can result in the loss of the protective slime coat found on the surface of the fish. Without this protective covering, the fish becomes susceptible to bacterial infections and parasites. Additionally, the skeleton of a billfish is designed for the buoyant conditions of the ocean. Removing the fish from the water, even onto the gunnel, causes the skeleton to come under the full strain of gravity, which can damage the skeleton and internal organs. It is vitally important that the tag be placed in the proper area: in the dorsal muscle well behind the head and gill plates, above the lateral line and away from all vital organs (see Figure 1). It is not necessary to use a great deal of force to insert the tag. A firm, well-aimed stroke is best. Place the applicator against the fish’s flank and push, inserting the tag until the stopper assembly is pressed against the fish. Improper tag placement or tagging too hard can result in serious injury or death to the fish. Speed tagging often results in injury. The fish should be released by removing the hook or cutting the leader as close to the hook as possible. It is preferred that an exhausted fish be revived by towing it slowly forward before release. 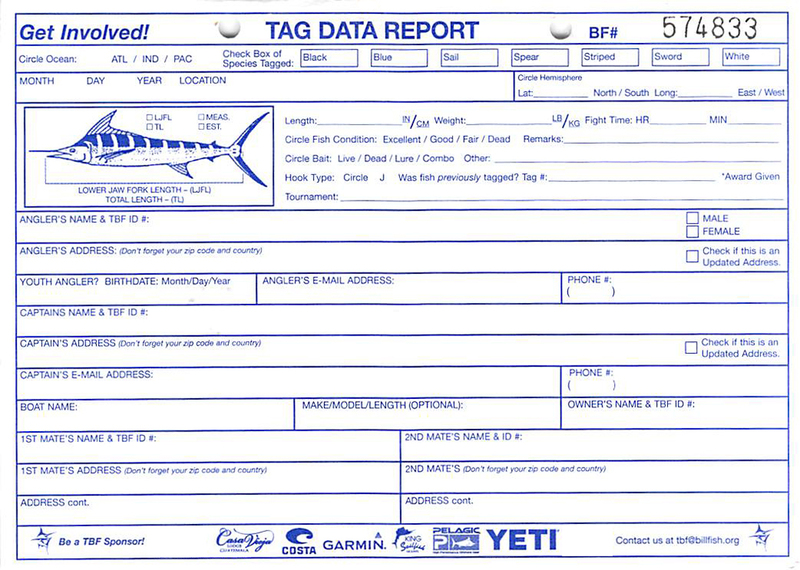 Please record the billfish data on the Tagging Data Report and mail in the completed card to TBF or enter the information online at www.tagbillfish.org . Returning tag recapture information is extremely important and an instrumental part of the tagging process. Without recapture information, the scientific loop is not completed and valuable data is lost. Tags previously placed on billfish are not always easy to find and in many instances have been in the fish for an extended period of time. Various forms of marine growth often attach to exposed portions of the tag, making the bright color of the streamer difficult to recognize. Therefore, before releasing every billfish that you catch and release, you should carefully examine the billfish and make sure there are no tags. The billfish tag has three major components, the tag head, a monofilament leader, and the tag body (see Figure 2). The tag head is composed of surgical grade nylon and can be left in the fish without causing harm. Rather than pulling the tag out of the fish and possibly causing damage, a release knife or other sharp object can be used to cut the monofilament leader attaching the tag to the tag head. To recover a tag from a caught billfish, make sure the fish is under control and left in the water. With one of the crew members controlling the bill and the fish, carefully remove the tag from the billfish by getting a firm grip on the tag and cutting the monofilament leader. Before releasing the fish, take a measurement from the bottom of the jaw to the fork in the tail and estimate the weight of the billfish. If possible re-tag the fish with a new tag. To increase the accuracy of the scientific data collected from the fish, record the location of the recapture. To report the recaptured billfish, call TBF at (954) 938-0150 or email TBF at tag@billfish.org with the information about the billfish. Remember the success of this program rests in the hands of all of us. TBF appreciates your support! As a reward, TBF will send both the original tagging captain, angler and mate as well as the recapture captain, angler and mate a recapture t-shirt as a thank you. In some regions, individuals will be put in a lottery for a cash award. In some places you can buy pre-made tagging poles. If not, the best ones are made from old broom or mop handles. They are made of hardwood about 1.5m (approximately 4 ½ feet) long and 2.5cm (1 inch) in diameter which makes them sturdy and reliable. A tag applicator hole should be drilled with a 5mm drill bit till only around 6cm of the tip protrudes from the pole. Use a good epoxy to secure the applicator pin in the pole and seal the hole to saltwater. The applicator pin should protrude from the pole about 6cm (2.5 inches). To prepare the tag stick for tagging, simply slide the nylon head of the tag over the pointed end of the stainless steel applicator. It is advisable to place a rubber band around the ‘pole’ and the ‘tag’ to help keep it in place till the fish is tagged.